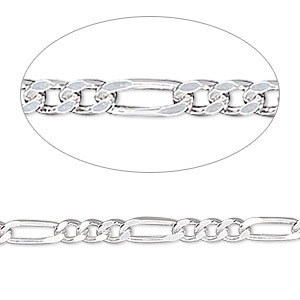 Chain, sterling silver, 1.7mm figaro, 20 inches. Sold individually. Item Number: H20-1273CH Have a question about this item? 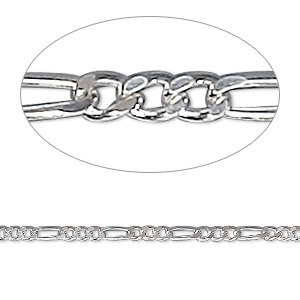 These high-quality chains are made using fine German and Italian chain-making machinery. Clasp style may vary. Chain, sterling silver, 1.7mm figaro, 18 inches. Sold individually. Chain, sterling silver, 1.7mm figaro, 24 inches. Sold individually. 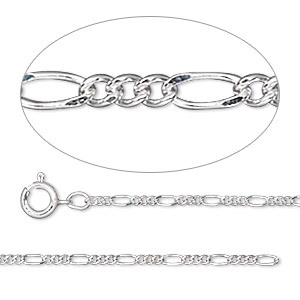 Chain, sterling silver, 1.7mm Figaro. Sold per pkg of 5 feet. Chain, sterling silver, 1.7mm figaro, 30 inches. Sold individually. Chain, sterling silver, 1.7mm figaro, 36 inches. Sold individually. Chain, sterling silver, 1.7mm Figaro. Sold per 50-foot spool.